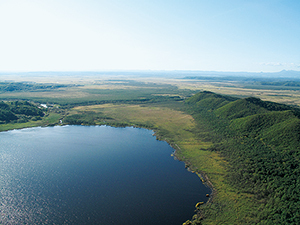 Encompassing the Kushiro River flowing through the eastern part of Hokkaido and its tributaries, Kushiroshitsugen National Park comprises Japan's largest marsh, the Kushiro Marsh, and the surrounding mountainous area. 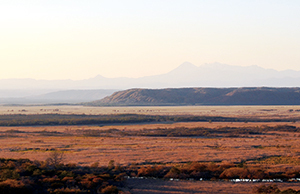 The vast, untouched horizontal landscape is the park's greatest attraction. It is also a valuable habitat for many flora and fauna, including the red-crowned crane, which has been designated a National Special Natural Monument. Due to the difficulty of developing the area, the Kushiro Marsh was regarded as a useless area of land, but through the development of agricultural land due to the food shortage in the postwar period, development of urban areas, and logging of hilly areas, the marsh began to dry out and the area diminished. In response, local researchers and nature conservation groups persevered with activities aimed at changing the perceptions of the marsh' value, with the result that the value was recognized internationally. 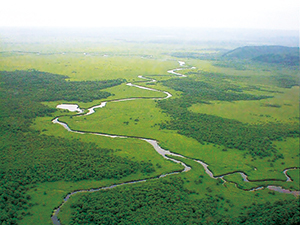 In 1980, the Kushiro Marsh became the first marsh area in Japan to be designated a Ramsar site, and seven years later, the marsh was designated a national park. The birth of Japan's first national park centered on a marsh can be said to have been an event that carved a new page in the history of Japanese national parks as the result of local efforts to have the marsh--once regarded as "barren land" --recognized for its natural environment value. 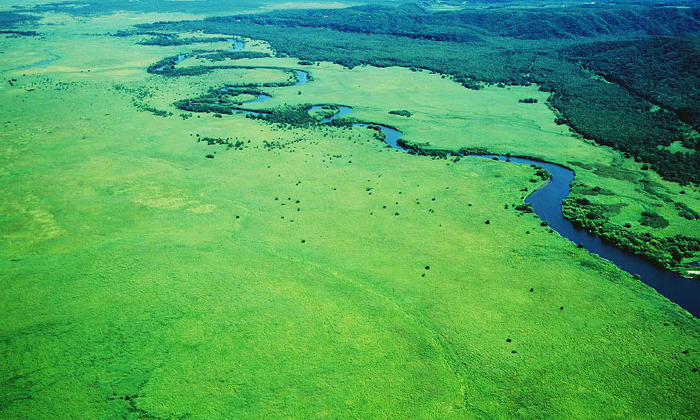 The Kushiro Marsh is shaped such that at the deepest point the marsh is approx. 40 km inland from the Pacific Ocean coastline, but in fact, this vast area of land was ocean in ancient times. During the Last Ice Age, the ocean surface, was lower than it is today, and the current marsh area was dry land. Approx. 3,000 years ago, the marsh look their current form, leaving several inland seas remaining. 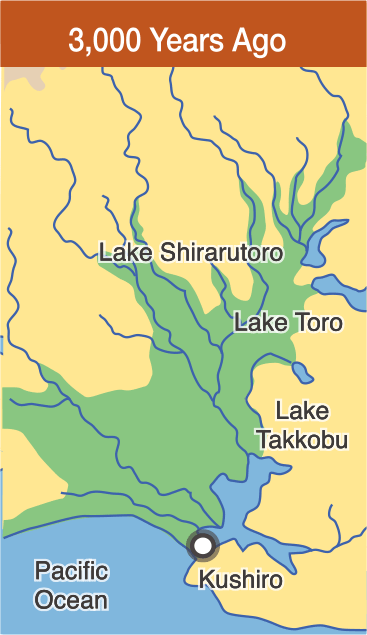 During the process of the ocean receding and the area becoming marsh, there were many lakes and reservoirs dotted about, as the diagram on the as the diagram above shows, but the ones that remain today are Lake Toro, Lake Shirarutoro, and Lake Takkobu on the eastern side of the marsh. Because these lakes/marshes remained filled with water even after the ocean receded, they are referred to as kaisekiko or lagoons. 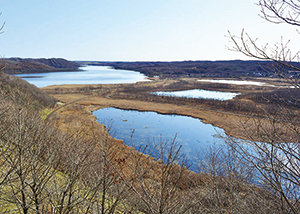 Furthermore, the marsh is surrounded by hills and plateaus, thought to have been ocean cliffs in the days when the marsh was ocean, and these are another characteristic of the Kushiro Marsh topography. 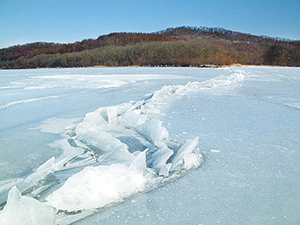 The reason that lakes and reservoirs are grouped together on the eastern side of Kushiro Marsh is said to be crustal movement. 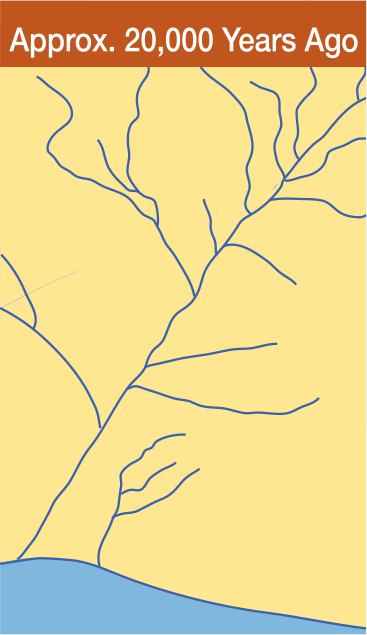 The eastern part of the marsh tends to sink while the western side tends toward prominence; thus, water accumulates in the lower eastern side, creating lakes. 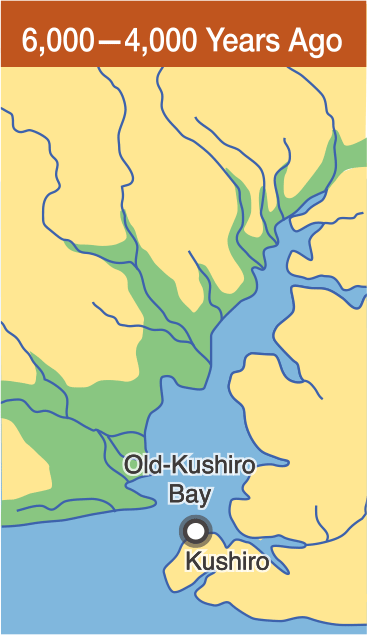 Similarly, the reason the Kushiro River flows on the east side of the marsh is because the marsh foundation has a high-west, low-east tendency. In the Kushiroshitsugen National Park, a lowland primitive natural environment that has already been lost in other regions in Japan has been preserved, and the park's highly natural, expansive horizontal landscape is unique and unparalleled in Japan. 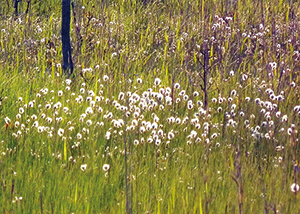 In the marsh grow plants that are distinctive because of their relationship with water. Approx. 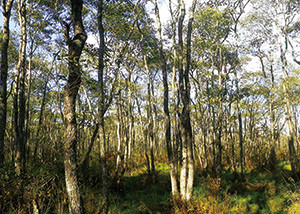 80% of the Kushiro Marsh comprises Fen/Carex marsh (fens) , where water can be seen on the surface of the ground, which is wet with water flowing in from surrounding areas, and vegetation --mainly Japanese alder --spreads as far as the eye can see. 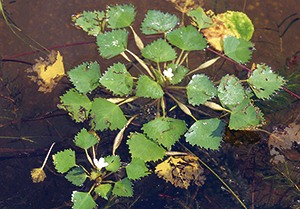 Moreover, there are alpine and cold-climate plants, such as cotton grass and crowberry, growing in sphagnum marsh (high moor) --where water cannot be seen on the surface of the ground, which is wet with rainwater --and waterweeds such as water chestnut and small yellow pond lilies can be seen in lakes and reservoirs. 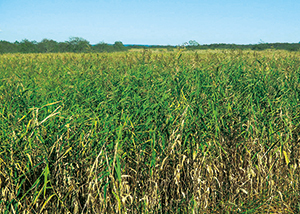 Altogether, more than 700 plant varieties can be seen in the marsh and surrounding areas. With its cold climate, Kushiro Marsh is also home to such flora as Polemonium caeruleum subsp. laxiflorum var. paludosum -- which is said to be a relic of the Ice Age --as well as bitter cress. 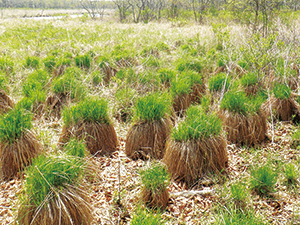 Environments appropriate for such species are extremely limited, and so Kushiro Marsh holds a very important position as a habitat for them. With their vast area, most of which has been preserved untouched by human hands, the Kushiro Marsh is home to a diversity of wildlife. Wildlife in the park includes 39 mammal species, approx. 200 bird species, 5 reptile species, 4 amphibian species, 38 fish species, and approx. 1,100 insect species. Representative of these are the Ezo red fox and Yezo deer; rare species include the white-tailed sea eagle, a large raptor; the Japanese huchen, Japan's largest freshwater fish; and the Leucorrhinia intermedia ijimai dragonfly. 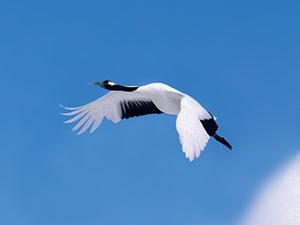 Representing Kushiro Marsh, the red-crowned crane has decreased in number due to over-hunting and environmental changes and at one point was thought to have become extinct; however, the population subsequently recovered due to various conservation efforts, and today the red-crowned crane can be observed in the eastern part of Hokkaido centered on Kushiro Marsh. 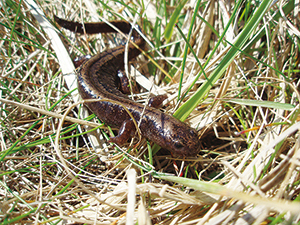 With its cold climate, Kushiro Marsh is also home to such fauna as the Siberian salamander --which is said to be a relic of the Ice Age. Environments appropriate for such species are extremely limited, and so Kushiro Marsh holds a very important position as a habitat for them. In approx. 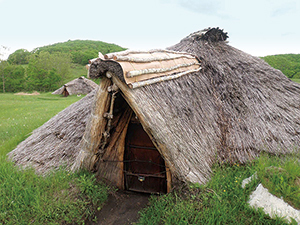 400 locations throughout the hills surrounding Kushiro Marsh are relics dating from the Old Stone Age to the age of Ainu culture. Many of these relics can be seen around Lake Shirarutoro, Lake Toro, and Lake Takkobu, as well as the plateaus along the eastern side of the Kushiro River; this is thought to be because these locations abundantly fulfilled living conditions such as transportation and food security. 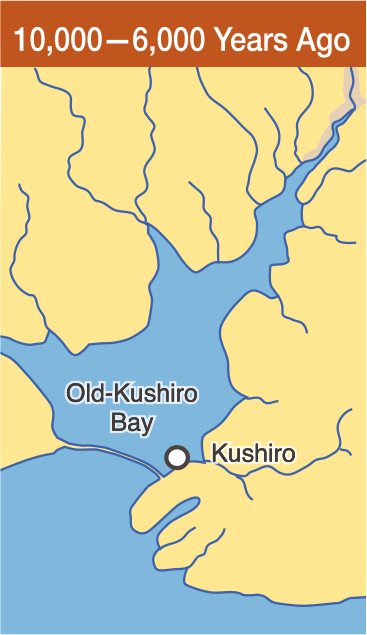 Furthermore, documents from the late Edo period indicate that there was a large Kotan (settlement) inhabited by Hokkaido's indigenous people, the Ainu, near Kushiro Marsh, in the Toro-Motomura district. The Ainu people formed Kotan according to blood relationships, hunting and fishing for food in the abundant environment. From rivers and lakes they caught salmon, trout, smelt, and other fish; and in the fields and mountains they hunted Yezo deer, brown bears, and other animals. They also gathered the seeds of alpine leeks, heartleaf lily, water chestnut, and other plants. 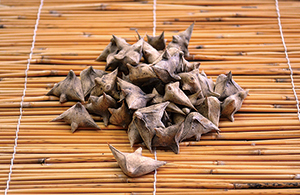 A specialty product of Lake Toro, water chestnut seeds are easy to gather, have a stable yield, and can be dried in the sun and stored; and so they were also used as a preserved food for winter. Until the mid-1970s, local residents held an annual festival on the shore of Lake Toro to give thanks for the blessings provided by Water Chestnuts called Bekan-bekamuinomi (Water Chestnut Seed Festival).